Strip flooring is usually referred to as hardwood flooring. Strip flooring typically is of white or red oak, maple, beech or birch; it is also often made of less expensive softwood such as hemlock, larch or elm. Strip dimensions are measured across the face of the strip, not including its protruding tongue. Typical widths include 1-1/2 inch, two inches, 2-1/4 inches and 3-1/4 inches. A commonly used width is 3/4 of an inch. One simple remedy is to place a one or two foot length of 2×4 on several sheets of newspaper (so as to avoid marring the floor’s finish). Rap the 2×4 sharply over the loose area in a steady rectangular pattern. Avoid repeatedly hammering the block on the same spot, so as not to split the tongue-and-groove of the flooring. Much more involved remedies include adding face nails (which you must countersink; apply putty to cover holes), strengthening the subfloor from below or injecting adhesive. Good drainage is fundamental to a well-made and well-maintained home. A damp or standing-water filled crawl space can cause a plethora of problems for hardwood floors (see below). Make sure water drains away from your home. Your gutters should be in good working order and should terminate several feet away from your home. When it come to wet crawl spaces, poor drainage and subsequent seepage are not the only culprits. For example, in one home, an air conditioning duct had been left unconnected and cooled air was discharging into the crawl space, causing condensation. This, in turn, caused the home’s tongue-in-groove hardwood floor to buckle. Here are some common problems with hardwood floors and some suggested solutions. Cupping, also called washboard — The edges of a piece of flooring (across its width) are high; the center is lower. This generally develops gradually. Moisture imbalance through the thickness is the only cause. Moisture is greater on the bottom of the piece than on the top. Find the source of moisture and eliminate it. A common source is a wet basement or crawlspace. Improve drainage around the home. Dehumidify the basement or crawlspace with properly sized dehumidifiers designed for each type of space. If it’s a crawlspace, make sure it has an adequate groundcover and close off all perimeter foundation vents and consider insulating the perimeter foundation walls and heating and cooling the space with the home’s central heating and cooling system. After the moisture has been eliminated, allow time for the floor to improve on its own. After it has stabilized, sand flat and finish. Crowning, the opposite of cupping, the center of a piece of flooring (across its width) is high; the edges are lower. It is commonly caused by moisture introduced to the top, the finish side, of the flooring, such as wet mopping or water leaks. Often crowning develops after the effort to remove cupping, when the sanding to remove the high edges has been done too soon after the moisture problem has been solved, before the floor has been given time to flatten on its own. To cure the crowning problem, give the floor plenty of time to stabilize on its own, then sand flat and finish. 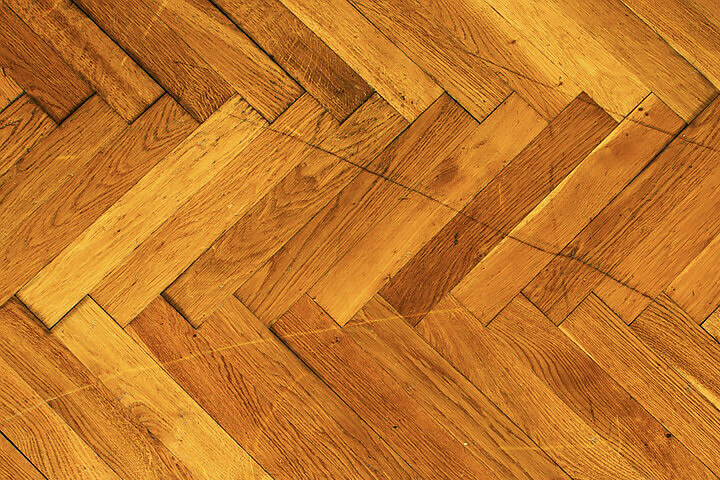 Be aware that slight cupping or crowning is common in wood floors and should be tolerated. In many cases it is seasonal. Buckling, tenting and ballooning floors develop when pieces of the flooring are no longer in contact with the subfloor surface. This is generally caused by extreme moisture below the floor, resulting from a wet basement or crawlspace, added with insufficient nailing, incorrect nails or incorrect subfloor construction. It also occurs when the installer makes the mistake of leaving no space for normal expansion. If caught early, spot repair and replacement might be possible. In many cases, however, the entire floor must be pulled up and re-laid or replaced. Cracks, separations between individual flooring pieces, are normal. Whereas excessive moisture causes problems, dryness causes cracking. Often, if a floor has experienced cupping or crowning and then been dried out, cracking will occur. White-, light-, and pastel-finished flooring will show cracks more than darker wood-tone finished floors. Many cracks are seasonal and show up in dry months or during months when heat is used inside the home. They usually shrink, however, during humid periods. One way to cure cracking is by introducing moisture into the home. Easy ways to do this are by boiling a pan of water, turning off the bathroom exhaust, and opening the dishwasher after the rinse cycle. Or, the homeowner can choose to live with the cracks. Minor dents, caused by high-heel shoes or heavy objects dropped on the floor, can be fixed if the wood fibers are not broken. Cover the dent with a dampened cloth and press with an electric iron to draw fibers up.